As a computational biologist I rather like the look of this year’s Nobel Prize for Chemistry – it’s been awarded for contributions to computational modelling, to Martin Karplus (University de Strasbourg/Harvard), Michael Levitt (Standford) and Arieh Warshel (University of Southern California). Molecular modelling takes several forms. The twist in the work the prize has been awarded for is multi-scale modelling, in their case bridging classical (Newtonian) and quantum modelling. Take a ball. Given the forces on the ball you can apply the ‘classical’ physics of Sir Isaac Newton (and those that furthered his work) to determine where the ball will be at a given time in the (near) future. That’s Newtonian modelling. Peter Murray-Rust, CC 2.5. Source: Wikimedia. We can think of molecules—chemicals of several atoms or many more—as balls connected by sticks, chemical bonds. 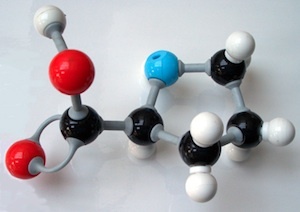 To the right is a ball-and-stick model of a single amino acid, proline. If you can treat atoms in a molecule as balls, you can apply Newtonian physics to them. Atoms are joined to each other by chemical bonds. Different types of bonds have different rotational properties. Some rotate freely, others less so. So we can add rotational properties to our model. There’s the different forces atoms have on eachother. We can simplify these to something like compressing springs that draw together or push apart atoms or groups that attract or repel eachother. Keep going and we can built up a method to simulate the motion of molecules. Because these equations are simple we can simulate quite large molecules using them. In our bodies proteins are large molecules that make up the molecular machinery that makes life work. Typical proteins are made of 100 or more amino acids joined in a chain and folded into a complex shape. Proteins often form part of large complexes of many proteins in association. To give some idea of the scale of full-size proteins a ball-and-stick model of two hexokinase proteins is shown below. Hexokinases are proteins that add phosphate to sugars like glucose that have six-carbon rings. Hexokinase changes shape as it binds it’s sugar. We could simulate how the protein changes shape. We could also try simulate how it adds the phosphate to the sugar. These are two different types of simulation. The first simulates the movements of the protein; the second the chemistry of a chemical reaction. There’s two scales, or degrees of accuracy, involved. There is the mechanics of the protein, how it moves. There is also a finer scale of how a chemical reaction takes place. For the mechanics you can treat the atoms as balls connected by sticks (bonds). You can’t do that and simulate a chemical reaction. 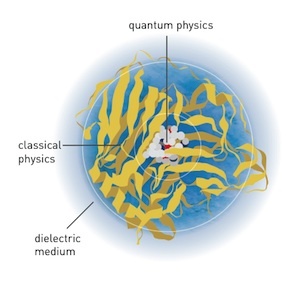 To look at, say, how light is gathered by plants, how an enzyme catalyses a chemical reaction or how the chemistry of a drug might work, you need to use quantum mechanics. This Nobel Prize was for multi-scale modelling. Their trick was to develop methods to let computational biologists or computational chemists simulate both Newtonian and quantum scales at the same time. It’s a practical thing, too. Quantum mechanics takes a lot more computer time to simulate that Newtonian physics. You can’t (easily) apply it to a whole enzyme—they’re just too big—but you might simulate just the key atoms involved in the chemistry and ‘somehow’ blend it into a Newtonian simulation of the rest of the enzyme. What these researchers have done is develop methods to do this. Large molecules like proteins can be thought of as a chemical framework holding a small number of atoms in an arrangement that some reaction occurs. These techniques make use of that only a small number of the atoms arranged in space are important to the detailed chemistry, while the rest make up the scaffold and environment that the reactions take place in. 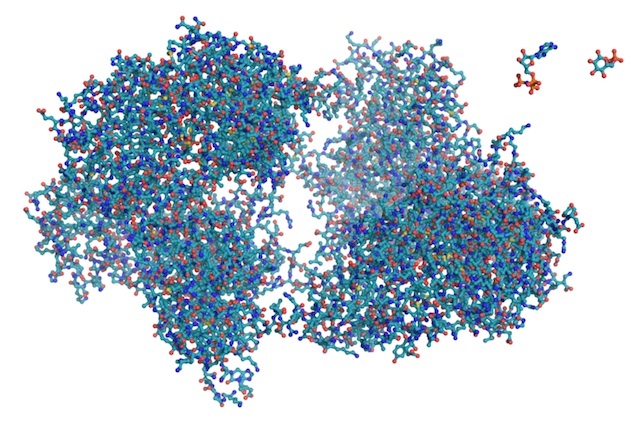 Computer modelling is widely used, not just in drug development but in understanding how the chemistry of life works. Research applications in this area blend chemistry, physics and biology to, literally, explore the chemistry of life. My Ph.D. thesis work included molecular simulation modelling of the free energy of association of short coiled-coil protein dimers. 1. A brief introduction to what proteins look like can be found in my article on a paper looking at knots in proteins. 2. In practice this was observed by X-ray crystallography of the ‘open’ and ‘closed’ forms of the protein (without and with a hexose sugar bound to the protein). 3. In simulating a chemical reaction you have to consider the free electrons that change state in the reaction. In the case of simulating the rest of the protein you can choose to use a simplified model of a typical, averaged, behaviour of that particular type of atom. 4. Some proteins don’t really do any chemistry, but interact with one-another. Molecular interactions can be use to build structures within our cells or regulate activities within our cells. For example, the proteins that alter the structure of our genomes or control gene regulation interact with DNA, altering the shape of our genomes and controlling what genes are used. One of the key aims of my new Not Just DNA series is to introduce physical aspects of genomes, how they ‘work’ inside our cell nucleus.